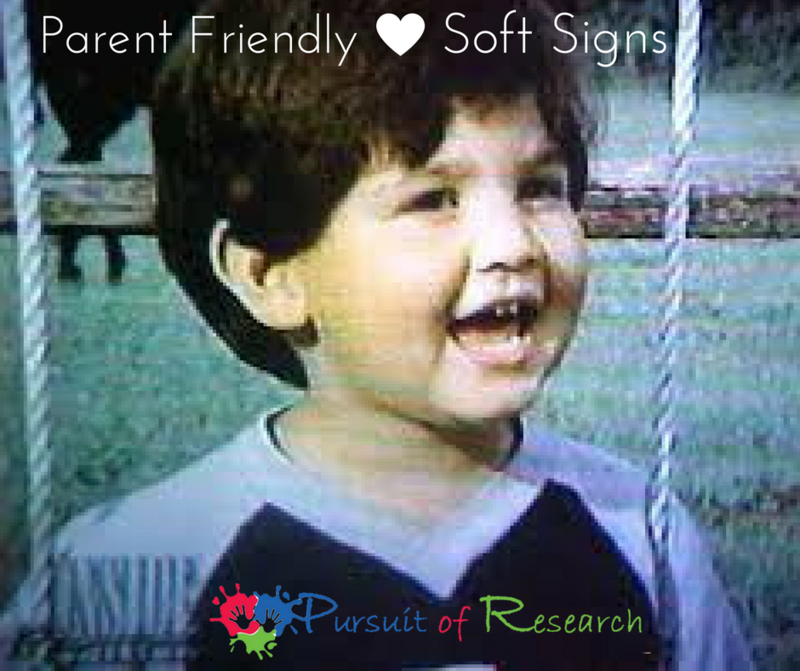 Typically we are seeing mild soft signs in children with apraxia. The average parent or even pediatrician can’t always spot them, why either a pediatric neurologist or developmental pediatrician evaluation is highly recommended if apraxia is diagnosed or suspected. Apraxia in itself is not a cognitive or receptive disorder, so the child knows what is expected of them. But face it -not much is expected of a 3 year old. So typically they are able to push themselves to keep up when younger. Why the neurologist is recommended early on. It’s as they get older, maybe school age, where more is expected of them and can’t keep up that they may start to break down. For example sitting upright at a desk for hours if they have hypotonia in the truncal area. So better to diagnose early so if there are any of these soft signs going on it can be addressed through early intervention as well through insurance and the IEP before they get to primary school. A child with hypotonia will feel heavier than a child of the same weight without hypotonia (kind of like the difference between picking up your child when he’s fast asleep vs. awake) Hypotonia can be anywhere in the body. Does your child appear to tire faster than other kids his age walking in the mall etc.? Will you and your wife not dream of taking him anywhere without the stroller because you know if you don’t bring the stroller you will be stuck carrying him because if you don’t pick him up he will sit on the floor crying with his arms in the air for you to pick him up again? And since he’s nonverbal -you will get looks from people passing by, or perhaps even comments -that your child is acting spoiled. When you pick him off the floor -it’s not as easy as it looks for you -or others that try! Most will say “wow he’s solid!” when picking him up. “Solid” is the word used by almost everyone to describe your child when people pick him up come to think of it. His body may look small and light -and many times both look like a cherub, and feel a bit like a marshmallow -rounded and soft. He may sit in the “W” position. If a child has severe hypotonia -he may look a bit like a rag doll (those are the children however that are spotted early however) -gravity just pulls them down. For a school age child -look for the child who can’t sit at the desk long before leaning down on it. The child who when waiting on line will either lean or sit down. The child (or adult) with rounded shoulders who is always being told “stand up straight!” or “sit up!” etc. Sensory Processing Disorder (formally sensory integration dysfunction) This is tough because it can affect any of the senses -touch, sight, hearing, motion, etc. So in a nutshell -Your child will seem to be bothered (or even in pain) by something that others aren’t and will not be bothered by something most are if that makes sense. Your child may insist on a certain color cup each time -and will throw a fit if it’s any other. My son for would carry a small cap from a pen or some other small strange object around for hours -and if you tried to open his clutched hand – he would have a meltdown -even if you thought he was asleep and tried to take the pen cap away so he wouldn’t choke on it while he was sleeping -he would wake up and freak out if he wasn’t 100% asleep yet. I want to explain what I was told by an OT why some of our children with SPD will carry an object around and not want to put it down, and why they will have a meltdown if you try to take it away is because some don’t feel pain normally , For example, every time someone taps you on your shoulder -it will feel the same. I mean they can tap harder or softer, their hands can be cold or warm -but it’s a tap- it’s not painful. With certain types of sensory processing disorders every time they get touched it feels different -sometimes it’s painful -but the world is a scary place. As long as they are holding onto that little object it feels the same -it’s a comfort. This is why they will have a meltdown if you take or even try to take the object away -or why they will continue to cry if you try to give it back to them -because it no longer feels the same. He wouldn’t cry for shots – but would say “oww” and cringe if you patted his head or tickled his arm. When Tanner was a baby (after the fevers and regression) his screams when I brought him to public places like the store would sound like high pitched extreme pain screams and he would stiffen his body -his eyes would bulge out -and he would do this just once in a while (Thank God) but when he did -he would cry till he fell asleep in a sweat -with nobody being able to figure out what was wrong (my Aunt has her PhD in nursing and my sister is a professional nanny -nobody had a clue) Just strange stuff that seemed quirky. DSI can also be the child that throws a tantrum like he’s in pain -while you have no clue what he’s crying about. Why DSI happens to a nonverbal child who is too young to let us know is a cruel joke -so it’s important for us to know if this is what your child has. The Out of Sync Child is one of the books most of us buy when our child is diagnosed with any multi faceted neurologically based communication disorder like apraxia. 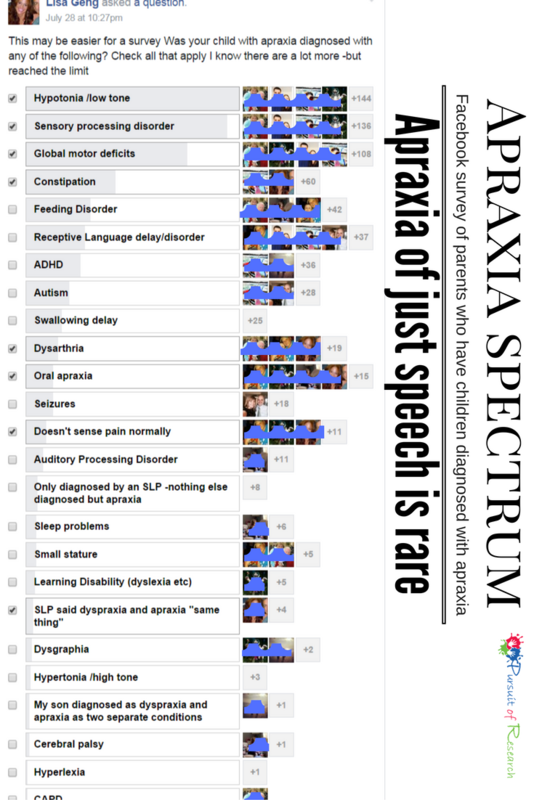 Apraxia or Dyspraxia. 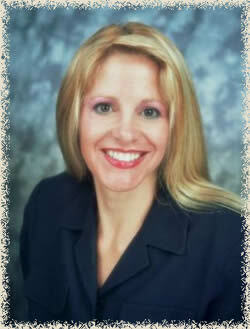 Just like with speech -your child may be able to do something once and then appear not to remember how to do it again. His actions look forced or planned -he’s slower because you can see he’s thinking before each movement. His development is a bit off in that he can do many things advanced -but for some reason can’t seem to do certain simple things that a much younger child even should be able to do. Again -just doesn’t make sense. Then you have to know if movement problems are from weakness (hypotonia) or motor planning (apraxia/dyspraxia) -just like with speech. Again -it could be a bit of both -and again -both are neurologically based. Hi, I was trying to find a support group for my son to connect with young adults who have Apraxia. As a young child he was diagnosed with severe apraxia. He use to come up to you and get right next to your ear and talk loud because he thought people had a hearing problem. Because when the therapist repeated back to him what he had just said it wasn’t right. Recently He said he would like to go to a doctor to fix his brain so that the words that he was trying to say would come out right. This is why I am hoping to have him be able to meet and chat with other young adults who struggle at times with Their communication. My son Tanner is now 20 years old and there is a large and growing number of teens and young adults like your child who grew up with apraxia. Please feel free to join both groups and have your son join YADA. For YADA even though we as parents can join, I ask that we allow just the teens and young adults talk there for the most part. This is my son Tanner’s story https://pursuitofresearch.org/2011/05/17/from-struggles-with-apraxia-to-honors-english-tanner-geng-and-his-success-story/ Tanner is part of YADA too. I would ba happy to put them in touch if you want -let me know!